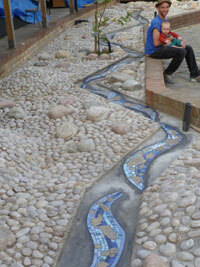 In July Monster Play asked Artyface to come in to make something for the new water feature in the playground (previously a planted bed). The deadline for completion was to be the end of August and pupils needed to be involved in this hands-on arty part of the project. 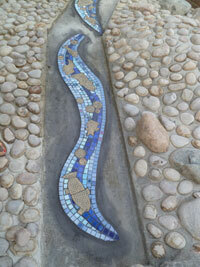 "Monsterplay were looking to create a unique and interactive feature for Sudbury School; we designed a riverbed water-feature that would contain mosaic work along with water-pumps, cobbles, boulders, reflective spheres and a memorial tree. 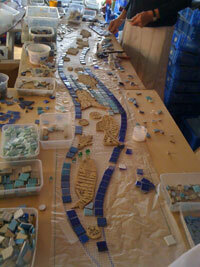 The Artyface team were a fantastic help in realizing the vision; working with the school to design and create the mosaic panels, and working with the installation team to integrate all the features together." 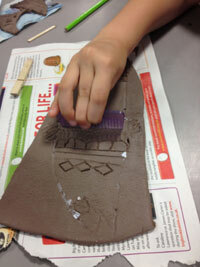 The art co-ordinator and Year 2 leader at Sudbury Primary School welcomed us in to do a day drawing and clay workshops, focusing on fish, with Year 2. 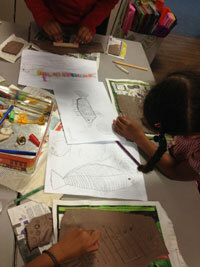 Catherine Clark worked with all 4 classes (120 pupils) drawing the shapes of fish with their textures and patterns. 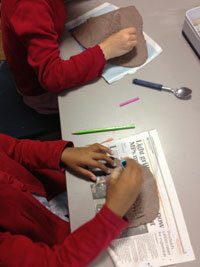 60 pupils then went to the Art Room where Rebecca and Becky had crank clay rolled out ready, and the children made their marks in the clay, making clay fish and bubbles. 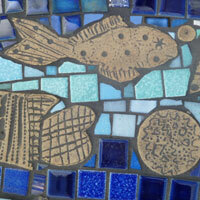 These were carefully dried out, oxided and fired to a high temperature making them frost proof and strong. 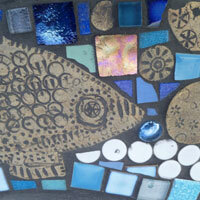 The fish were laid out onto fibreglass mesh and mosaiced around in watery waves, using some recycled tiles. 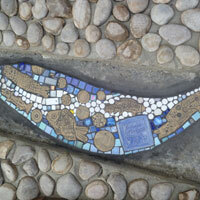 The mosaics were laid and grouted at the end of August as promised, in time for the builders to finish the water feature and the pupils to come back in September and admire their clever work.